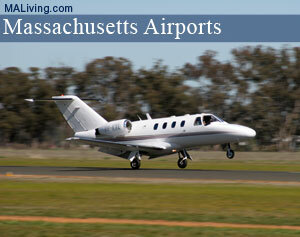 The New Bedford Regional Airport is a public airport located two miles from downtown New Bedford, Massachusetts. This airport is owned by the City of New Bedford. New Bedford airport has two asphalt runways; 5/23 measuring 4,997 x 150 ft (1,523 x 46 m) and 14/32 measuring 5,000 x 150 ft (1,524 x 46 m). The only scheduled airline available here is the Cape Air regional airline. MA Living suggests you call to confirm the information before scheduling your flight. To feature your Berkshire MA business, contact us. Learn more about advertising in MALiving.com. WHEN ATCT CLSD ACTVT HIRL RY 05/23; MIRL RY 14/32; MALSR RYS 05 & 23; REIL RY 32 – CTAF. VASI RYS 23 & 32 OPER 24 HRS.